At the end of the 18th century, the present painting was documented in the collection of the Marchesi Arditi di Castelvetere, an ancient noble family of Lombard origin who moved to Apulia during the reign of Emperor Frederick II. One of the most illustrious members of this family was Michele Arditi, later Marquis of Castelvetere (Presicce 1746 – Naples 1838), who was a scholar of antiquities, and from 1780 onwards was increasingly involved in the archeological excavations of Pompei and Herculaneum and the study of antiquities, being largely responsible for writing the 8th volume of Delle Antichità di Ercolano (Delle lucerne e dei candelabri antichi) (Of Antiquities of Herculaneum (of ancient lamps and candelabras)). In 1799 due to the uprising in Naples and subsequent proclamation of the Neapolitan Republic, he fled to his estate at Presicce, Apulia where he stayed until 1801. Due to his considerable scholarly reputation, Michele Arditi was chosen by Giuseppe Bonaparte, King of Naples, as the first director of the Museo Nazionale of Naples and Sovrintendente of archeological excavations. He was confirmed in this important position by Gioacchino Murat and by Ferdinando di Borbone, after the Restoration. Michele Arditi worked up until his death, increasing the collections of the Reale Museo Borbonico and working on some of the most important archaeological excavations of the age, such as the Anfiteatro Campano in Capua, the ruins of the fourth temple of Paestum and the temple of Venus at Baia. There is no exact date on when the painting entered the Arditi di Castelvetere collection, but it was certainly already present in the late 18th century since Marchese Michele Arditi loaned it to the Reale Museo Borbonico until his death, at which point it was returned to his heirs and has passed down by descent until the present. 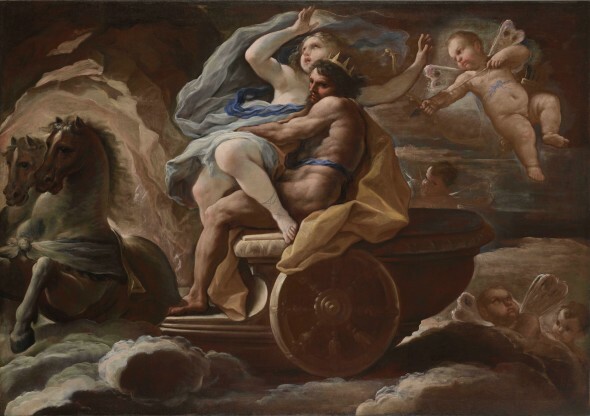 After first hand inspection of the painting, Professor Nicola Spinosa has stated that the Abduction of Proserpina is a fine example of the later style of Giordano, dating to around 1690. The theme of the Abduction of Proserpina, as narrated by Ovid in the Metamorphosis (V, 341 – 641), was previously painted by Giordano three other times. In Classical mythology, Proserpina (or Persephone in Greek Mythology), the enchanting goddess of Springtime, is the daughter of Jupiter and Ceres, goddess of agriculture. In order to bring love to Pluto, Venus had her son Amor shoot him with an arrow, and he fell in love with the young Proserpina. While she was collecting flowers with nymphs, Pluto emerged from the volcano Etna with four black horses and abducted the goddess. Agonized by the loss of her daughter, Ceres stopped the growth of fruits and vegetables and winter descended on Earth. The first two depictions by Giordano can be found in both the frescos of Palazzo Medici Riccardi in Florence, part of a large set of mythological frescoes that Giordano executed in the years 1682/’85, and in the preparatory drawings for these (London, Sir Denis Mahon collection; cfr. O. Ferrari – G. Scavizzi, Luca Giordano. L’opera completa, Napoli 1992, pp. 314 315, nn. A386, A387j). Much closer in style is the canvas of the Patrimonio Nacional, now at the Casita del Principe at El Escorial, probably painted for Marie Louise of Orleans, Queen of Spain and first wife of King Charles II who was one of the main patrons of Luca Giordano in his later years (cfr. Ferrari – Scavizzi, 1992, p. 324, n. A454, fig. 1). The painting in the Spanish Royal Collections is a little smaller in dimension (136 x 155 cm) and has two main stylistic differences: a darker setting and the presence of a group of nymphs that come running to the aid of Proserpina –whereas, in the present painting there are four Amorini, the foremost one ready to shoot Pluto with the arrow of Love – whilst the main group of figures with Pluto abducting Proserpina on his chariot shares the same composition as in the present work. As proposed by Nicola Spinosa the present Abduction of Proserpina was almost certainly painted in Naples around 1688 – 1690, probably commissioned by a collector (possibly an ancestor of Michele Arditi) who saw the painting ordered by the Queen of Spain in Giordano’s studio and asked for a replica with some variations. It should be also pointed out that in 1769 the art historian Giuseppe Oretti in his book Le pitture che si ammirano nelli Palazzi e Case delli Nobili della città di Bologna (The Paintings in the Palazzi and Noble Houses in Bologna) mentions a pair of paintings in the collection of Palazzo Ranuzzi, a Rapture of Proserpina and a Rapture of Helen, but without further information, it is impossible to decide if the Ranuzzi painting is the same one that was later in the Arditi Collection.